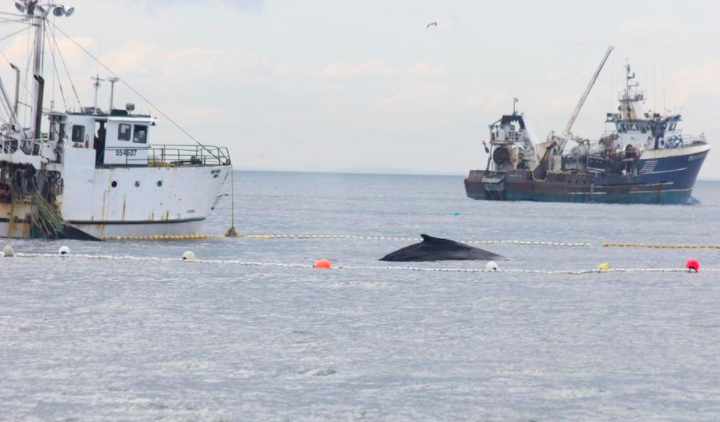 The humpback whale known as "Owl" is seen caught in a fishing net off the Isles of Shoals Thursday afternoon. A whale caught in a fishing net last week appeared fine when seen swimming in the area over the weekend, said Dianna Schulte, research coordinator and co-founder of the Blue Ocean Society for Marine Conservation. Named “Owl,” the 32-year-old humpback whale “appears to be OK physically,” she elaborated. Owl was entangled in the fishing net deployed off a “purse-seiner” vessel Aug. 30 off the Isles of Shoals, a small group of islands straddling the border between Maine and New Hampshire, according to multiple witnesses. The witnesses included 85 people aboard a Granite State Whale Watch tour, led by captain Peter Reynolds. Schulte said Friday the crew on the whale watch boat had a combined 65-plus years of whale-watching experience, including three Coast Guard licensed captains on board, and they had “never seen such a blatant whale harassment case.” She said the incident was reported and is under investigation by National Oceanic and Atmospheric Administration law enforcement.